Relatives mourn as a man carries the body of a dead boy in a blanket at a site hit by what activists said was a barrel bomb dropped by forces loyal to Syria's President Bashar al-Assad in Sheikh Khodr area in Aleppo on September 30, 2014. (New York) – The Syrian government has carried out hundreds of new indiscriminate attacks over the past year with air-delivered munitions, including improvised weapons such as barrel bombs. The attacks have had a devastating impact on civilians, killing or injuring thousands of people. 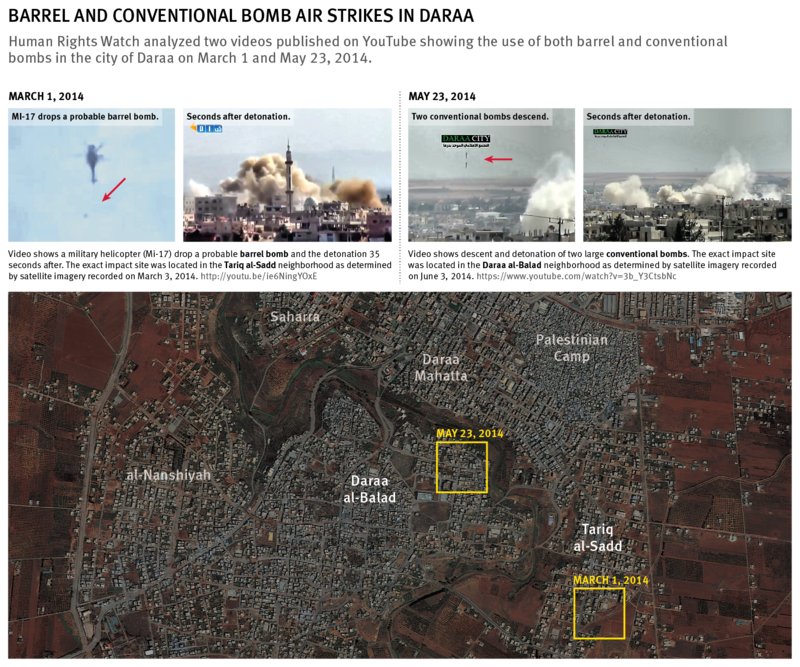 Human Rights Watch documented the attacks in Aleppo governorate in northern Syria and in Daraa governorate in the south based on witness statements, satellite imagery analysis, and video and photographic evidence. Although the United Nations Security Council condemned the attacks in a resolution adopted a year ago, it has not responded directly to the new wave of attacks. In an interview with the BBC on February 10, 2015, President Assad claimed that his forces were not using barrel bombs in spite of a wealth of evidence to the contrary. The Security Council will meet on February 26 for its next round of reporting on resolution 2139 of February 22, 2014, which demanded that all parties to the conflict in Syria end the indiscriminate use of barrel bombs and other weapons in populated areas. Non-state armed groups have also conducted indiscriminate attacks, including with car bombs and explosive weapons in government held areas. The Security Council should impose an arms embargo on the government as well as rebel groups implicated in widespread or systematic indiscriminate attacks, Human Rights Watch said. By examining satellite imagery, Human Rights Watch identified at least 450 distinct major damage sites in 10 towns and villages held by rebel groups in Daraa and over 1,000 in Aleppo between February 22, 2014, and January 25, 2015. These impact sites have damage signatures strongly consistent with the detonation of large, air-dropped munitions, including improvised barrel and conventional bombs dropped by helicopters. Damages that possibly result from the use of rockets, missiles, or fuel-air bombs are also likely in a number of instances. Human Rights Watch also examined dozens of videos uploaded to YouTube of major impact sites, as well as videos of Syrian Mi-17 helicopters dropping both improvised barrel and conventional bombs on populated areas of Aleppo, the city of Daraa, and the town of Dael, in Daraa governorate. By matching video landmarks with satellite imagery and 3D models, Human Rights Watch determined the location, approximate time of day, and date of the attacks. Human Rights Watch in October 2014 interviewed 20 residents of Daraa governorate who witnessed or were injured in barrel bomb attacks and six doctors providing treatment in Jordan to those injured in the attacks on Daraa. These interviews provided new information on the impact of such attacks on Daraa residents. One of the doctors treating wounded Syrians from Daraa in a hospital in Amman told Human Rights Watch in late 2014 that women and children make up two-thirds of the victims they receive and that most were being injured by fragments of explosive weapons. A doctor at a second Amman hospital receiving Syrians with war wounds said that during the same period, 50 or 60 percent of the injured seeking treatment at the hospital were women and children and that the injuries were predominately fragmentation wounds from explosive weapons. The government attacks have led to the death and injury of thousands of civilians in rebel held territory. The Violations Documentation Center (VDC), a local monitoring group, has documented 609 civilian deaths, including 203 children and 117 women, in Daraa from aerial attacks between February 22, 2014, and February 19, 2015. During the same period they have documented 2,576 civilian deaths in Aleppo governorate from aerial attacks, including 636 children and 317 women. While deaths from aerial attacks are not exclusively from barrel bombs, residents from rebel held territory in Daraa and Aleppo told Human Rights Watch that barrel bombs account for a majority of air strikes. In a report released on February 22, the Syrian Network for Human Rights reported that 6,163 civilians, including 1,892 children and 1,720 women, have been killed in government barrel bomb attacks since the passage of UN Security Council Resolution 2139. The Security Council should impose an arms embargo on Syria’s government and any groups implicated in widespread or systematic human rights abuses. Such an embargo would limit the Syrian government’s ability to conduct aerial attacks that violate international law, including by prohibiting providing Syria with new helicopters or providing outside support for servicing them. The Security Council should also impose a travel ban and an asset freeze on individuals credibly implicated in grave abuses, and refer the situation to the International Criminal Court, Human Rights Watch said. Under international law, providing weapons to forces or armed groups in Syria that are likely to be used in the commission of crimes against humanity may amount to assisting in the commission of those crimes. Any arms supplier could bear potential criminal liability as an accessory to those crimes and face prosecution, Human Rights Watch said. In both Aleppo and Daraa, Human Rights Watch documented repeated barrel bomb attacks since the passage of Security Council Resolution 2139 on February 22, 2014, striking near or on medical facilities, and in residential areas with schools, mosques, and markets, and without discernible military targets in the vicinity. Barrel bombs are unguided high explosive weapons that are cheaply made, locally produced, and typically constructed from large oil drums, gas cylinders, and water tanks, filled with high explosives and scrap metal to enhance fragmentation, and then dropped from helicopters usually flying at high altitude. Human Rights Watch has previously documented the destructive effect of barrel bomb attacks on civilian life in Aleppo in March, April, and July 2014. Military commanders should not order the use of explosive weapons with wide-area effects in populated areas because they are inherently indiscriminate, Human Rights Watch said. The overall distribution and intensity of major damage sites in Aleppo, the city of Daraa, and in Dael, Nawa, Inkhil, and Jassem in Daraa governorate suggests that government forces targeted the entirety of the populated towns with explosive weapons over the course of months. Based on its review of satellite imagery of the city of Daraa, Human Rights Watch has concluded that neighborhoods in the central and southern parts of the city known to be under rebel control suffered the most damage, including Daraa al-Balad, Daraa Mahatta, Tariq al-Sadd, Al-Manshiyah, and Palestinian camp. “Area bombardment” is prohibited under international humanitarian law. Such attacks by artillery or other means treat as a single military objective a number of clearly separated and distinct military objectives in an area containing a concentration of civilians and civilian objects. In addition to demanding that all parties in Syria cease indiscriminate attacks in populated areas, UN Security Council Resolution 2139 strongly condemns the arbitrary detention and torture of civilians in Syria, as well as the kidnappings, abductions, and forced disappearances. The resolution demands the immediate end of these practices and the release of all arbitrarily detained people, starting with women and children, as well as sick, wounded, and elderly people, and including UN personnel and journalists. The resolution also calls on the parties to cease unlawful restrictions on the delivery of humanitarian assistance. In light of the Syrian government’s failure to comply with the February resolution, the council passed resolution 2165 on July 14, authorizing UN agencies and their implementing partners to deliver aid across Syria’s borders and conflict lines. Despite expressing “its intent to take further steps in the case of non-compliance with this resolution,” the council has not passed any follow up resolutions on detainees, indiscriminate attacks, or the government’s use of unlawful sieges on areas with civilians. Human Rights Watch has also documented the repeated failure of various rebel groups, including members of the Free Syrian Army (FSA) and the Islamic Front, as well as extremist groups such as the Islamic State and Jabhat al-Nusra, to comply with the Security Council’s demands on indiscriminate attacks, detainees, and humanitarian assistance. A doctor with the Aleppo City Medical Council, an independent nonprofit organization providing medical services in the city of Aleppo, told Human Rights Watch that government forces attacked some of their medical facilities using barrel bombs. He said that barrel bombs hit two well-marked hospitals in the al-Shaar and Hanano neighborhoods of Aleppo on April 13 and 21 respectively. The location of the two hospitals, whose existence predates the conflict, would be known to the government. The doctor told Human Rights Watch that the government forces began repeatedly striking hospitals with aerial attacks around January 2014 and struck hospitals that contained no military targets in Hanano, al-Sukari, al-Sakhour, and al-Shaar. The Amal hospital is about a two-minute walk from the place that I was hit. Four barrels fell. One on the bakery, one on our street, one 25 meters away from my uncle’s house, and the fourth 25 meters from the first. Two dropped and then two more, in two rounds. It was 3:30 in the afternoon [and the bombs fell in a busy market area]…. My neighbor evacuated me and took me to the Amal hospital, which is about 300 meters away. They hit all around the hospital. The hospital has also been hit before. The VDC has identified eight people killed in the strike, including three children and three women. Wassim independently gave the names of several of those the VDC identified, including Mohamed Khaled al-Halaki, his wife, three children, and sister. He said others were killed but he did not know their names. Mohamed’s children were Khalid, who was in first grade, Heba, 5, and Ghia, the youngest, who was 2 or 3 years old, he said. Wassim said that some FSA fighters who were getting food in the market were also injured in the second barrel bomb attack. He said there were no checkpoints near the strike site and that fighting at the time was two kilometers away on the outskirts of the village. Human Rights Watch reviewed three videos published on YouTube showing the immediate aftermath of the attack at one of the affected locations, including the injured and material destruction. Human Rights Watch identified the exact location of the site by matching features in the videos with satellite imagery recorded both before and after the attack. Analysis of satellite imagery recorded on August 15 showed evidence of multiple damage sites consistent with the detonation of large, air-dropped weapons including barrel bombs. Impact sites were concentrated in the center of Jassem in the vicinity of the Amal hospital, consistent with witness statements. According to witnesses and a VDC report, a government air strike also damaged al-Radwan Hospital in Jassem on May 15, reportedly with targeted missiles. Human Rights Watch reviewed a video posted on YouTube appearing to show the same hospital, with a commentary that said it showed the aftermath of an aerial attack on a field hospital there on May 15, and identified evidence in satellite imagery recorded after the attack confirming the exact location of the video and that the hospital was damaged. Human Rights Watch also interviewed “Samih,” a 50-year-old humanitarian worker from Nawa who fled the fighting there for the nearby town of Dael. On March 26, he said he witnessed the aftermath of an attack in Dael in which the government forces dropped four barrel bombs in residential areas. Two barrel bombs struck schools, one hit the road leading to Tafas, and the fourth landed near a residence in the middle of the village, he said. The fourth barrel bomb hit a small school bus, killing or wounding about a dozen children, including Samih’s nephew and niece, who both lost their legs. Samih said the village was held by rebel fighters he described as from the Free Syrian Army, but he said no fighters were based in the village. Most of the dead were children who were in the service [small school bus] hit by the barrel.… There were 16 in the service … Bisan Khalil al-Kankari, 10, was killed.… Three other kids from one family … [my niece] lost both her legs below the knee … [and my nephew] was injured in the face and lost both of his legs. Human Rights Watch met Samih’s niece and nephew, who had injuries consistent with Samih’s descriptions. The VDC also identified Bisan as one of the victims of the attack and published a photo showing her injuries. Samih said the four adults killed were the driver of the small school bus, two brothers, and the wife of a local doctor. A video published on YouTube also says it shows one of the male victims of the strikes that day and identifies him as Iyad Mohammed Mustafa al-Sherif, but it is not clear where in Dael he was at the time. Samih told Human Rights Watch there was no fighting in Dael at the time of the attack. He said that the police station is approximately two kilometers from where the small school bus was struck and that there were no checkpoints inside the village that could have been targets. He said the nearest military position was one kilometer to the north. Human Rights Watch reviewed three videos published on YouTube reportedly showing the immediate aftermath of barrel bomb detonations in Dael on March 16, June 29, and July 7, as well as a video recorded on March 31 showing a Mi-17 helicopter dropping a single barrel bomb. The videos also show apparent civilians, including children, elderly men, and a woman in the immediate vicinity of the attacks. Human Rights Watch identified the exact location of each of these sites by matching features in the videos with satellite imagery recorded before and after the attack. Analysis of satellite imagery recorded on August 15 showed evidence of over 30 major damage sites consistent with the detonation of large, air-dropped weapons including barrel bombs. I was on the road from Jassem [when the explosion happened and then] … I went to the place of the explosion. There was shrapnel 500 meters away. In the house next to where the barrel fell, two women were injured. I took them to the field hospital.... No one died … the house where the two barrels fell was empty because of the war. I heard the sound [of the barrel falling] and saw the helicopter.… It fell close to al-Omari Mosque. Talal told Human Rights Watch there was no fighting around the strike site at the time and that the nearest military position was a Free Syrian Army position 500 meters to the north. The following month, on April 2 or 3, Talal said, he witnessed another barrel bomb attack in Inkhil. The attack stuck a resident’s house, killing a 22-year-old man whom Talal described as a civilian. “A big barrel hit, the second barrel didn’t explode … I was 200 meters away. I saw the helicopter and the barrel and then the second barrel,” he said. “We went to the house … [and then] took him to Jassem but he died on the road.” He said several other villagers were injured: “There were 13 injured that I saw, five kids, two women, and three or four old men. Eleven houses were affected.” A witness said there was no fighting in the middle of the village where the bombs were dropped. Human Rights Watch identified multiple damage sites consistent with the detonation of barrel or other conventional bombs immediately next to and in the vicinity of the al-Omari Mosque in Inkhil with satellite imagery recorded both before and after the attack. Analysis of satellite imagery recorded on August 15 showed evidence of multiple damage sites consistent with the detonation of large, air-dropped weapons concentrated in the center of Inkhil, consistent with witness statements. I didn’t think it [the barrel] would fall on the house…. There was one helicopter that dropped four barrels. I saw the barrels falling and heard the barrels. I had difficulty breathing from the debris of the explosion. I leapt to the ground and ate dirt. The first barrel hit the house. The whole house was destroyed. The three other barrels fell around the house 200-300 meters away but didn’t explode. Yousef’s wife, who was in the house with their two children, was killed. “When I saw the plane I told them [the kids] to go inside,” he said. Human Rights Watch met Yousif’s children and observed their injuries. His son, 9, was injured in the attack, and doctors had to amputate both legs below the knee. His daughter, 7, had one leg amputated above the knee. Yousef told Human Rights Watch that his brother was also injured in the attack, but he believed he had survived. The VDC, however, identified his brother (name withheld) as having been killed in the attack. At least two other children were injured in the attack, Yousef said. Yousif said there were no known military positions near the strike site and no fighters in the vicinity at the time. The nearest location with FSA fighters, a nearby village, was 2 kilometers away and the closest front line was 12 kilometers away.